Reservations over the use of the treadmill in prisons were strong enough to prompt politicians and prison officials to look for alternatives. In 1823, one year after the invention of the treadmill, Sir John Hippisley, a member of the British parliament, came up with the idea of the crank mill, which he believed produced the same effect as the treadmill, but with added benefits. 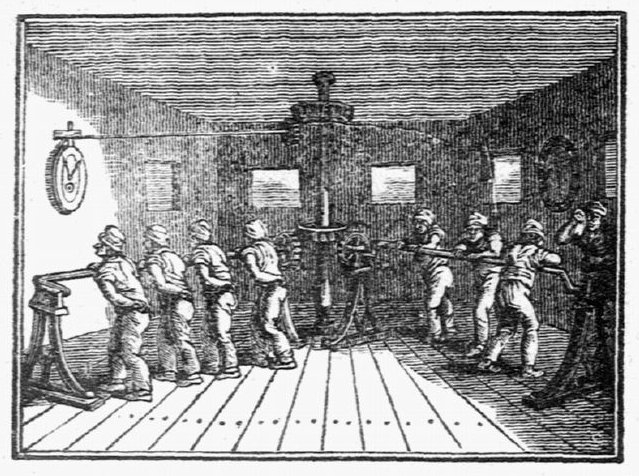 Rather than using their legs to rotate a cylinder in a stepping motion, convicts at the crank mill would use their arms to rotate a long bar in a vertical circular motion. Any number of bars could be connected to, and radiate out from, a central shaft that, like the treadmill, could turn stones for grinding corn. The seeming advantage of the crank mill is that convicts could situate themselves in a number of positions. They could stand with their right foot forward or their left. They could use one arm or two. They could even face one another as they rotated the bar. These variations would presumably reduce fatigue and put convicts less at risk to injury. Hippisley also maintained that the crank mill could essentially police itself by means of a counter connected to the machine, so that the inspector could see the number of times the convicts rotated the crank during his absence (although such a device could just as easily be connected to the treadmill). Even though the crank mill seemingly minimized the potentially injurious effects of the treadmill, its inventor admitted that its use could “be extended to a dangerous excess, without good vigilance on the part of the superintendants.” And for this reason, Hippisley recommended that female convicts be exempt from using both the crank mill and the treadmill. The New York Evening Post published an engraving of Hippisley’s crank mill, which was then reprinted in several other American newspapers. But the idea did not go far. As with the treadmill, American politicians and prison officials had little interest in adopting the mechanism. And neither did the politicians and prison officials in England. This was written by Anthony Vaver. Posted on Wednesday, March 13, 2013, at 7:11 am. Filed under Prisons and Punishments. Tagged Criminal Justice System - America, Criminal Justice System - England, Imprisonment, New York, Punishment. Bookmark the permalink. Follow comments here with the RSS feed. Post a comment or leave a trackback.